David 'Jack' Coverdale (born 22 September 1951) is an English rock singer. He is most famous for his work with hard rock band Whitesnake. The band was very successful commercially. During his early career Coverdale was the vocalist of Deep Purple for some time. He left the band to become a solo artist, and worked with Whitesnake. He also made an album with Led Zeppelin guitarist Jimmy Page. This was also successful. Coverdale was born on 22 September 1951, in Saltburn-by-the-Sea, Redcar and Cleveland, England. His love for music developed early. Around the age of 14, he began performing professionally as he wanted to be a singer. He developed his style of singing then. "I don't think my voice had broken," he explained to Sounds in 1974. "And that's when I first learnt how to sing with my stomach, which sounds silly, but it's totally different from a normal voice." Coverdale had been the vocalist local bands like The Government (1968–1972); Fabulosa Brothers (1972–73). In 1973, Coverdale saw an article in a copy of Melody Maker, which said that Deep Purple was auditioning for singers to replace Ian Gillan. Coverdale was the frontman of a local group called The Government. They had played with Deep Purple in 1969. So both he and the band knew one another. Coverdale first sent a tape to the band. Then, he auditioned to become a singer. He was admitted into the band, with bassist Glenn Hughes being another vocalist. In February 1974, Deep Purple released their first album with Coverdale and Hughes called Burn which was certified Gold in the US on 20 March 1974 and in the UK on 1 July. In April 1974, Coverdale and Deep Purple performed to over 200,000 music fans at the California Jam. . This was his first trip to America. In December 1974 Burn was followed-up by Stormbringer. This also ranked at Gold album status in the US and the UK. The album had funk and sould influences. So guitarist Ritchie Blackmore left the band in June 1975. Coverdale did not want Deep Purple to disband. He helped in persuading the band to continue with American guitarist Tommy Bolin (of Billy Cobham and The James Gang). So Jon Lord said, "David Coverdale came up to me and said, 'Please keep the band together.' David played me the album that Tommy did with Billy Cobham. We liked his playing on it and invited Tommy to audition.'" The band released one studio album with Bolin, Come Taste the Band in 1975. The album was less successful than previous records. At the end of the tour in March 1976, Coverdale walked off in tears. He handed in his resignation. But he was told Deep Purple was disbanding. So he had no band left to quit. The decision to disband Deep Purple had been made some time before the last show by Lord and Ian Paice (the last remaining original members). Lord and Paice had not told anyone else. The break-up was finally made public in July 1976. Said Coverdale in an interview: "I was frightened to leave the band. Purple was my life, Purple gave me my break, but all the same I wanted out." After the end of Deep Purple, Coverdale started a solo career. He released his first album in February 1977. It was called White Snake. All songs were written by Coverdale and guitarist Micky Moody. Coverdale later said about this album: "It's very difficult to think back and talk sensibly about the first album. White Snake had been a very inward looking, reflective and low-key affair in many ways, written and recorded as it was in the aftermath of the collapse of Deep Purple." Even though the album was not successful, its title inspired the name of Coverdale's future band. In 1978 Coverdale released his second solo album Northwinds. It was received much better than White Snake. But before the album's release, he had already formed a new band. After recording Northwinds, Coverdale soon formed the band Whitesnake. Bernie Marsden and Micky Moody played guitar in the band. It began as a touring band for Coverdale's first solo album. But, it soon developed into a full-time band. In early 1978, the band released the Snakebite EP. It was repackaged later. It was released as a full album called Snakebite, released in June 1978, with the B-side taken from Coverdale's Northwinds album. For the next album, Trouble, Coverdale was joined by his former Deep Purple colleague, keyboardist Jon Lord. For Whitesnake's 1980 album, Ready an' Willing, drummer Ian Paice also joined the group. Ready an' Willing also featured the band's biggest hit up to then. This was the song "Fool for Your Loving". It reached #13 on the British charts and #53 on the U.S. Billboard Hot 100. Ready an' Willing was followed up by the even more successful Come an' Get It in 1981. During 1982 Coverdale took some time off to look after his sick daughter. He decided to put Whitesnake on hold. When David Coverdale returned, he reformed the band. They recorded the album Saints & Sinners after this. In 1982, according to British heavy metal magazine Kerrang!, Coverdale was considered for the vocalist position with Black Sabbath following the departure of Ronnie James Dio. Coverdale declined. Whitesnake became very popular in the UK, Europe, and Asia, but not in North America. In 1984, the album Slide It In finally entered the US charts (reaching #40). But it did not reach high enough to be considered a hit. When Slide It In was going to be released in the US, Coverdale made a calculated attempt at changing Whitesnake's sound and look. He recruited John Sykes from the remnants of Thin Lizzy for this. Sykes brought a more contemporary, aggressive guitar sound with him. He also had good stage manners to match. In 1985, Sykes and Coverdale started working on new songs for the next album. But Coverdale soon contracted a serious sinus infection. So he could not record that year. Doctors said he might not be able to sing again. Coverdale eventually recovered, and recordings were continued. But before their upcoming album was fully recorded and released, Coverdale had dismissed Sykes from the band. In many period interviews, Coverdale stated that the next album was a make-or-break album for Whitesnake. If not successful, he would disband Whitesnake altogether. During 1987 and 1988, Whitesnake finally became successful in North America. They released the multi-platinum self-titled Whitesnake album. It was co-written (for most of the songs) by Sykes. But guitar was played by virtuoso Adrian Vandenberg, as a session musician. The 1987 album has sold 8 times platinum since its release. It had hit singles like "Here I Go Again" and "Is This Love". It finally made Whitesnake a concert headliner in North America. Through the late 80s and early 90s, in the "hair-band" era, Coverdale kept Whitesnake going with great success. But lineups changed many times. 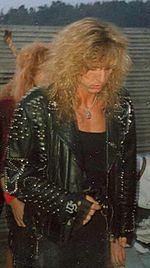 In 1989 Coverdale recruited Vandenberg to recorded a new album, Slip of the Tongue. Vandenberg co-wrote the entire album with Coverdale. But he had a wrist injury. So he could not do solo guitar. Fellow virtuoso Steve Vai was recruited. He re-recorded most of Vandenberg's existing parts and finished the album. Upon release, it was very successful in Europe and the U.S. The following tour, for which Vandenberg returned to play along with Vai, made Whitesnake famous as a giant in the world of hard rock. The album peaked at number 10 in the U.S., and has achieved platinum status. The tour continued until the end of 1990. "It got louder and louder, and so did I, to the point now where I have to get dressed up like a "girly man" and tease ones questionable bangs or hair and it's all becoming a bit... boring." In 1990 Coverdale sang and co-wrote (with Hans Zimmer and Billy Idol) the song "The Last Note of Freedom" for the Tony Scott movie Days of Thunder. On 26 September 1990, after the last show on the Slip of the Tongue tour in Tokyo, Coverdale disbanded Whitesnake indefinitely. He was tired of the business in general and troubled by his separation and later divorce from Tawny Kitaen. Coverdale wanted to find other values in life. He took "private time to reflect" and think where his career was going. The hiatus did not last long. In the early spring of 1991, Coverdale collaborated with guitarist Jimmy Page of Led Zeppelin fame. Both of them have said that the collaboration revitalized them on many levels. This collaboration led to the Coverdale-Page album. It was released in March 1993. The album was a hit all over the world. It reached number 4 in the UK and number 5 in the US. It was certified Platinum in the US on 7 April 1995. But the US tour for the album had to be cancelled due to slow ticket sales. After only a limited Japanese tour, Coverdale and Page parted ways. In part, the problem had been the comparison to Robert Plant who had been the Led Zeppelin vocalist, with Jimmy Page. Some of their audience criticized Coverdale. They thought he was too similar to Plant. Others felt the collaboration only served to inspire Page to once again join Plant, a year later. In 1994 Coverdale assembled a new line-up of Whitesnake (with the exception of Coverdale's musical partner, guitarist Adrian Vandenberg and bassist Rudy Sarzo, both of whom had been in Whitesnake since 1987). Whitesnake was to tour for the release of their Greatest Hits album. The band again broke-up after the tour. After this Coverdale once again went away from the music business, for three years. In 1997 Coverdale returned and released Restless Heart (with Vandenberg on guitar). The album was originally meant to be Coverdale's solo album. But the record company forced it to be released under the name of "David Coverdale & Whitesnake". The tour was called Whitesnake's farewell tour, during which Coverdale and Vandenberg played two unplugged shows (one in Japan and the other for VH1). The first of the two shows was released the next year under the title Starkers in Tokyo. After the Restless Heart-tour ended, Coverdale once again ended Whitesnake and took another short break from music. In 2000 Coverdale released his first solo album in 22 years, titled Into The Light. The album was not a hit. But it did return Coverdale to the music business. In December 2002, Coverdale re-reformed Whitesnake for an American and European tour, with Tommy Aldridge on drums, Marco Mendoza (bass), Doug Aldrich (guitar), Reb Beach (guitar) and keyboardist Timothy Drury. In 2004-2005, Whitesnake went on a tour of the United States, South America and Europe. A live DVD, shot during the 2005 tour at the legendary Hammersmith Apollo was released in February 2006. In June 2006, Coverdale signed a new record deal with Steamhammer Records. The first release under the record label was the double live album Live: In the Shadow of the Blues (released 27 November 2006). The album also contained 4 brand new studio tracks. They were written by Coverdale and Aldrich. In 2008 the band (with new bassist and drummer) released its first new studio album in over 10 years titled Good to Be Bad. The band toured for the album extensively. Also in 2008, Whitesnake went on a European Tour with fellow Yorkshire rock band Def Leppard. In 2009, Whitesnake toured with Judas Priest on the British Steel Anniversary Tour. On 11 August 2009, Whitesnake was playing a show at Red Rocks Amphitheatre in Morrison, Colorado, when Coverdale suffered a vocal injury. After seeing a specialist, it was announced on 12 August 2009 that Coverdale is suffering from severe vocal fold edema. He has a left vocal fold vascular lesion. The rest of their tour with Judas Priest was cancelled. In early February 2010, David Coverdale has announced his voice seems to have fully recovered from the injury. He says he's been recording new demos. He wants to create a new Whitesnake album. On tape his voice is sounding full and strong. The latest Whitesnake studio album "Forevermore" was released on 25 March 2011, with Aldrich and Beach on board. Coverdale was first married in 1974 to Julia, and their daughter Jessica was born in 1978. Coverdale's second marriage was to actress Tawny Kitaen, from 17 February 1989. They divorced in April 1991. Kitaen was known for her provocative appearances in Whitesnake's music videos for "Here I Go Again", "Is This Love" and "Still of the Night." Since 1997, he has been married to Cindy, an author with works such as The Food That Rocks. They have a son, Jasper (born 1996). On 1 March 2007, Coverdale became a U.S. citizen, in a ceremony in Reno. He now holds dual US/UK citizenship. He has lived near Lake Tahoe, Nevada for more than 20 years. ↑ 1.0 1.1 Prato, Greg. "David Coverdale: Biography". MSN Music. Retrieved 5 November 2009. ↑ "RIAA Gold & Platinum database". Retrieved 17 July 2009. ↑ "Whitesnake chart stats". Archived from the original on 2012-05-25. ↑ "david coverdale interview". YouTube. 19 January 2006. Retrieved 2012-01-02. ↑ "RIAA Gold & Platinum database". Retrieved 2011-12-15. ↑ "Whitesnake Too Many Tears Vh1 Unplugged 1997 By Ari". YouTube. 21 November 1997. Retrieved 2012-01-02. ↑ "Whitesnake - Too Many Tears & The Deeper The Love (Acoustic VH1 1997)". YouTube. Retrieved 2012-01-02. ↑ Syrjala, Marko (14 November 2006). "WHITESNAKE Guitarist Doug Aldrich". Metal Rules. Retrieved 21 February 2012. In December 2002 Coverdale reunited Whitesnake for Whitesnake's 25 year anniversary. ↑ Emerson, Lisa (13 August 2009). "Whitesnake singer David Coverdale injures vocal cords". WTSP. ↑ "Here he goes again". Ellesmere Port Pioneer. Cheshire Online. 29 June 2006. Retrieved 14 March 2011. ↑ "Whitesnake's Coverdale Is Supportive Of Wife's New Career". Blabbermouth.net. 8 March 2004. Retrieved 14 March 2011. Wikimedia Commons has media related to David Coverdale. This page was last changed on 11 December 2018, at 13:22.